On December 30, 2014, the Greek Coast Guard was alerted to the possibility that a ship off the Mediterranean Island of Othonoi was carrying "illegal immigrants" after authorities received a strange cell-phone emergency call from an unknown person. Before the Coast Guard could dispatch assistance a person claiming to be the ship’s captain reported that it was a false alarm. He said the ship was in no danger and not requesting assistance. At that time the vessel changed course and steamed toward southern Italy. That ship was the cargo carrier Blue Sky M.
Having been alerted, the Italian port authorities met the freighter at sea with two helicopters carrying six Italian Coast Guard officers. That crew was shocked to find the ship operating on autopilot, without a crew, and racing toward the Italian coast. Also on board were an estimated 800 Syrian migrants that had paid dearly to board the ship and escape the horrors of the Syrian civil warfare. A Coast Guard spokesman said the officers took command of the ship and "raced against the clock" to unlock the engines and turn the vessel before it crashed into the coast. The successfully turned the ship and brought it safely into the harbor of Gallipoli. The passengers, all men, women and children, were brought ashore. Some had to be hospitalized and at least four of them were reportedly found dead. The rest were temporarily housed in local schools and a gymnasium. 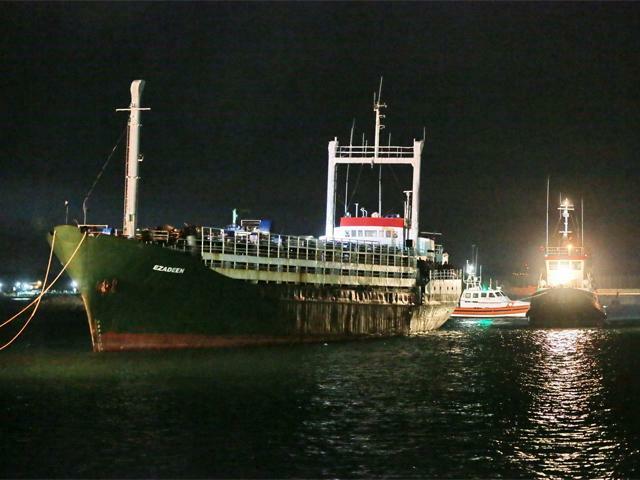 Authorities said the Blue Sky M was a 39-year-old, 265-foot cargo carrier registered under the Moldovan flag and owned by Info Market SRL, a Romanian shipping company. The ship left Korfez, Turkey, on Dec. 14 bound for Croatia. But the vessel was believed to have turned toward the coast of Syria where the human cargo was taken aboard from small fishing boats. They said the passengers paid up to $2,000 a head to board the ship, then were forced to ride in the cold winter weather, huddling together for warmth. To make matters worse, the freighter was caught in a winter gale at about the time it was nearing the Italian coast. Authorities say the smuggling of Syrian refugees to European countries has been big business for organized criminals who are using old junk ships to take them on one-way trips. As the freighter steams toward the coast, the "crew" jumps ship and either lets the vessel drift or run full speed toward shore, as they did the Blue Sky M.